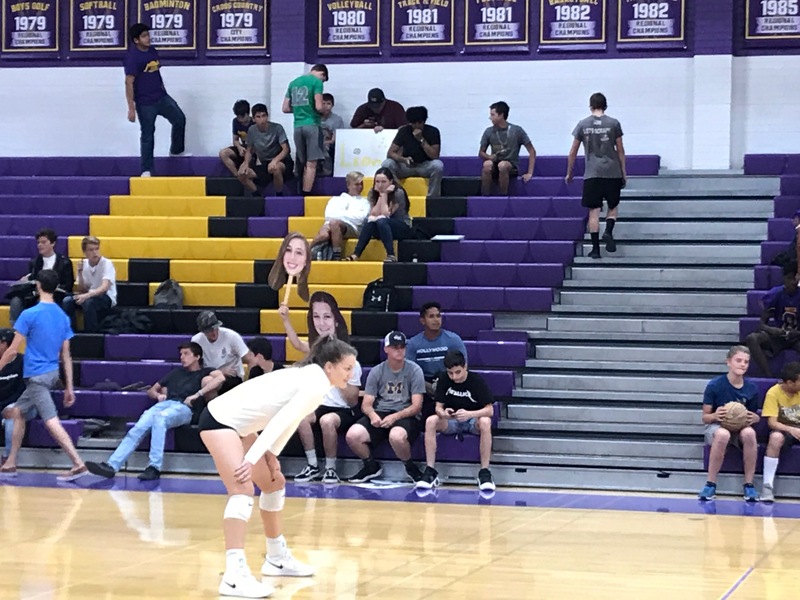 Mesa High's Annie Hatch prepares in pregame to register another monster game on the attack with 38 kills in Mesa High's four-set victory over Desert Ridge on Thursday night. (AzPreps365 photo). 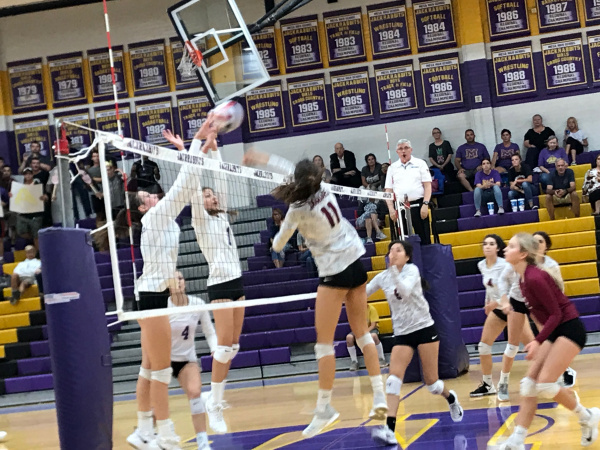 Mesa High girls volleyball coach Amy Strawn didn't want to wait to the second week of the season to compete in an invitational so this year she entered her Jackrabbits in the Goldwater Festival Aug. 31-Sept.1. With daughters Annie and Kate Hatch the lone returning varsity players with experience she wanted her very green team to get a bunch of matches behind them win or lose. Mesa had been a frequent participant at the House of Payne Invitational, but that wasn't on the calender until Week 2. Strawn is seeing dividends to that as Mesa has recovered from a slow start and continued in that vein Thursday night with a four-set triumph over Desert Ridge at Jackrabbit Gym. Scores were 25-22, 14-25, 25-21 and 25-13. 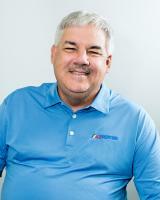 "Goldwater helped us so much," Strawn said. "We started off slow and I knew it could happen because we're so young. Annie, Kate and Brielle (Bowden) were the only ones back from varsity last year. That tournament helped us find ourselves and give us some confidence. Mesa (11-5 overall and 5-2 in power ranking matches) opened the season getting swept by Highland and Perry. The Jackrabbits posted a 6-3 mark at Goldwater and and have reeled off seven wins in a row -- five of the power-ranking variety. To be sure the two players returning with experience for Mesa are well above average if not outstanding. Senior Annie Hatch nearly hit the 40-kill mark for the third match this season Thursday, finishing with 38. Hatch, the two-time 6A East Valley Region players of the year and an all-conference first team selection last year, has made verbal commitment to Iowa State. Kate Hatch, a junior, checked in with seven kills and 36 assists. Middles Bridgit and Brooklin Carter chimed in with a combined seven kills and sophomore outside Ashytyn Michaels added five kills. Helping turn the tide to Mesa's side after the teams split the first two sets was freshman Quincy Cummard , who managed to disrupt Desert Ridge with solid serving. Cummard was particularly effective in the fourth set. Desert Ridge (8-6 overall, 4-3 power-ranking matches) played well last week in the House of Payne Invite. The Jaguars won four of seven matches and reached the Gold Division Bracket. Their losses were to semifinalist Horizon and tourney champ Millennium twice. Desert Ridge seemed to suffer through inconsistency set to set Thursday. After a late run at winning the first set and falling just short, they commanded the second set. They led only one time in the final two sets (1-0 in the fourth) and struggled to the finish of the match. Desert Ridge was led on the attack (unofficial stats) by junior outside hitter Amanda Jonovich (18 kills) and senior outside-libero Ally Duffy (12 kills). Mesa and Desert Ridge continue their busy weeks Friday and Saturday at the annual Westwood Tournament of Champions. Desert Ridge played matches Tuesday, Wednesday and Thursday and Mesa Tuesday and Thursday heading to the tournament.